In his Automating Inefficiencies screencast, Zach Holman (left) showed some of the goofy ways GitHub uses animated gifs, inside jokes, and hacks to make their Campfire chat room more fun. Now he's got a followup piece, Why GitHub Hacks on Side Projects, which talks about the importance of building out "a side project culture." For GitHub, a Campfire bot that does all sorts of kooky things is the answer. Read the full piece to learn why Zach thinks having pleasant distractions and an open, shared space to explore together is important. ShermansTravel Media is a two-part organization. It aggregates and syndicates travel deals and content, and also has a luxury travel magazine. Eric Lubow, Email Systems Administrator at ShermansTravel, talks about how the company uses Campfire below. Why do you need Campfire? Currently our engineering department is the only department in the company that uses Campfire. Other parts of our business use Basecamp, but the engineering team primarily uses Campfire to communicate. We do this because we have a team of 8 individuals that work out of 3 or more separate physical locations. One of those individuals works out of Manchester, UK while the rest of us share the US east coast time zone. It is now part of everyone's routine that when they sit down at their computer, they login to Campfire to start their day. Campfire allows us to communicate without being intrusive. IM can be excessively intrusive and distracting at times because it is an "in your face" method of getting someone's attention and involving them in a conversation. Campfire also has the added ability of letting the QA folks send a quick screenshot to the group if something doesn't seem right. It's also useful for sharing files that wouldn't normally be shared via Google Docs or Basecamp. The Campfire API (less the API and more straight Ruby code) allows our application to interact with us. When our syndication feeds go stale on a particular host, we have a cronjob send an image of Frodo from Lord of the Rings into our channel telling us to fix the feeds. Every time someone commits to the subversion repository, a commit hook is fired off and the commit message along with the file names that were updated are put into the chat for everyone to see. We also make use of the '@' autocomplete syntax because we have multiple Matt's who are in the chat room. Most of us use Mac and have additionally "hooked up" Campfire to growl so we are notified when someone is either talking about us or talking about something we need to know about. We use some of the Greasemonkey scripts that have been written to interface with Campfire. (Click for larger version.) A screenshot of ShermansTravel's Campfire instance with a few Nagios alerts. Learn more about this Nagios notify-by-Campfire Plugin. The sad fact is that we used a combination of IM, Trac, and Basecamp. They are all great fits for their purpose in their own right, but didn't meet our needs for unintrusive on the spot communication. Tell us a story about a project or situation where the product helped you out. We recently cut over ISPs and in order to achieve this, we needed everyone in the same place at the same time. We could have had a conference call, but that call would have involved nearly 15 people all with their own issues all fighting to get a word in. So we went with Campfire and opened it up publicly. We had our internal 8 team members there along with representation from our new ISP and our database managed service providers. Everyone was working from a different location and if someone needed to talk to someone else verbally, everyone had everyone else's cell phones, Skype names, and we always had the fallback Campfire conference line provided. None of that was needed, we were able to work it all out via the Campfire chat. Look into available Greasemonkey scripts. The user autocomplete and the Growl interaction makes the use of Campfire even easier. Most of the engineers use Fluid.App for Mac for the Greasemonkey scripts. The idea is to keep it in a window separate from your default browser because your browser has a tendency to crash. As with any engineering department in a small business, we are working on an average of no less than 5 - 10 projects at once. Campfire allows multiple discussions to happen simultaneously and all participants to see things that may be more pertinent to them at another time. 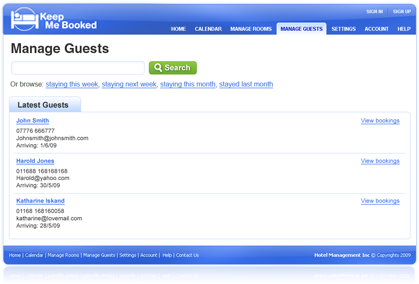 Bruce Greig runs KeepMeBooked, a web-based app for guesthouse and B&B owners to manage their reservations and guests, and take online bookings. Below he describes how his team uses Campfire. I'm in the UK and I run a small team of developers who are based in Indonesia. Dealing with complex issues over the phone can be hard even in your mother tongue - so you have to be super-fluent in a second language to be able to use it for detailed discussions over the telephone. The Indonesia team speak great English, but not quite good enough for the telephone. So we use Campfire instead of voice. I originally considered this a compromise. I thought, well, communication might be a little harder, but that will be worth it because the cost of living (therefore cost of employment) is so much lower in Indonesia than in the UK. 1. You can take your time. You can stop and think for as long as you need mid-discussion. It's awkward to do that over the phone or when standing next to someone. 2. You review what you say before you say it. You can't do that with your spoken voice. If you are speaking, you never notice your own slip of the tongue, so you might end up talking for a few minutes at cross purposes before you figure out the confusion. With Campfire, I always re-read what I just typed and either correct it before sending, or immediately afterwards. Apple profiles Twitter and along the way mentions the engineering team there uses Campfire to communicate. When software engineering teams work in multiple group chats, they use Campfire, a web-based group chat service for the Mac and iPhone.